Chi Burger was in the mood for soup, and Fat Bruce Lee (no longer on a diet...sigh) and I tagged along in Chi Burger's motorized ashtray. This time Fat Bruce Lee strayed from his traditional burger. Instead he had a monstrous pastrami sandwich...more to follow. Parking was free with validation in the attached lot. I ordered the 1/2 pound, $10.95 (cheese was $.85 more...grrrr), Build-A-Burger with American cheese and lettuce and tomato on the side. Our meals arrived in about 10 minutes. 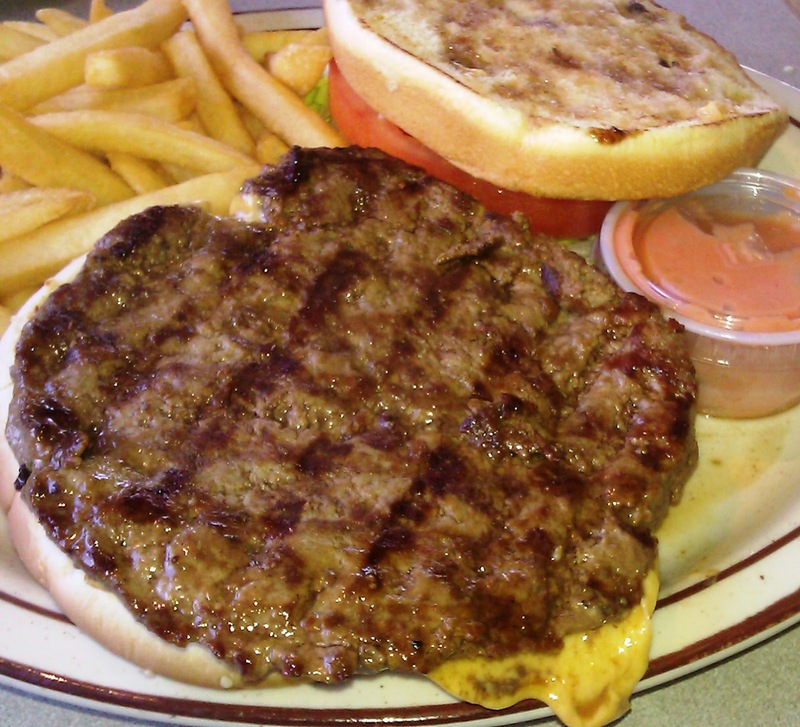 The Beef: Junior's Deli served up a cheeseburger made from 100% Chuck. They proudly stated this on the menu. I did find it a little confusing that they made a point of touting the use of Chuck, but who was I to question this? This was a two-note burger patty....beef and skank. The burger was automatically cooked to a moderately chewy Well-Done, so the plentiful collagen in the Chuck melted completely. This gave the burger the characteristic beefy flavor that we have come to expect from Chuck. The hefty funk was bordering on unpleasant. It seemed relatively clear why the burger was cooked to Well-Done. The beef was very likely past its prime. This resulted in a nearly tangy flavor--I said a little prayer for my immune system as I took my second bite. The texture was also a little off-putting. The bacteria that had been, apparently, having their way with the ground beef had worked their magic on the beef proteins to the point that the texture resembled a grainy, soft brisket. This, coupled with the high cooking temperature, resulted in a mouth feel that was not especially burger-like. The burger was relatively juicy, and it was certainly not oily. All the fats rendered off in the cooking process. 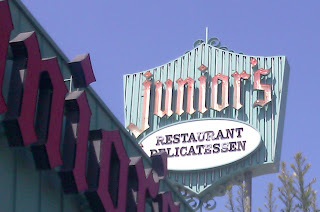 The Seasoning: I detected only the mildest hint of salt on the exterior of the burger patty at Junior's Deli. The Sear: Meh. Junior's Deli cooked the burger on a gas-fired grill, which was just hot enough to impart grill marks on the patty. The Preparation: The rubbery, flat patties at Junior's Deli were probably hand-formed during morning prep, but I just didn't care enough to ask. The flavor was sub par, and this just drained me of all enthusiasm to dig deeper into the origins of the burger. The burgers were turned 3 times on the grill, and that was 2 times too many. The Cheese: The $.85 slice of American cheese was properly melted, but it contributed nothing to the dish. The tangy funk of the burger overwhelmed any flavor from the cheese. The grainy texture of the beef masked any creaminess that the cheese may have had to offer. The Bun: The burger bun at Junior's Deli was a big, floppy, seeded, generic burger bun. The bun was fresh. It was utterly bland and neutral in flavor. It was also very weakly toasted. As a result, the bun was a passive delivery vehicle for the burger patty. The Toppings: The Iceberg lettuce was fresh and fine. The slice of tomato. Wow! That was the single-most revolting bite of tomato that I had ever tasted. It was out of my mouth and into my napkin almost instantly. It tasted like it had been used to wrap fish. The Fries: The standard, peel-off fries at Junior's Deli came from a bag, and they tasted like they came from a bag. The fries were bland and tasted nothing of the earth. The fries were unseasoned. The fries were....Meh. 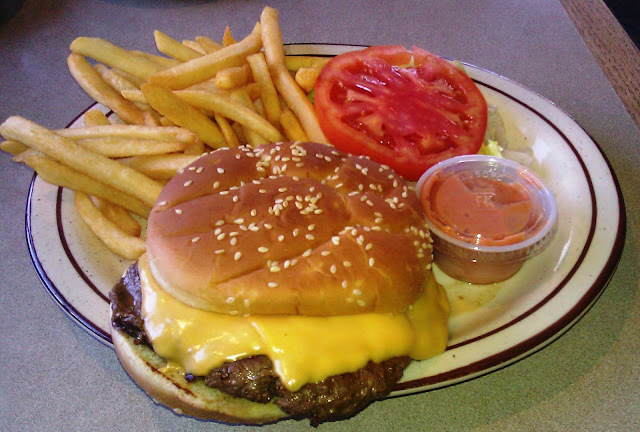 The Value: At Junior's Deli, an 8-ounce cheeseburger was $11.35. Sadly, that cheeseburger was made from beef, which was past its prime. The quality just wasn't there. As a result, the value was weak. On a side note...Chi Burger loved his tureen of Matzoh Ball Soup. Fat Bruce Lee powered through his Pastrami Sandwich with no complaints. Later he did note that he felt that his intestines were coated with Russian dressing, and that he was ready to drop a Pastrami bomb. 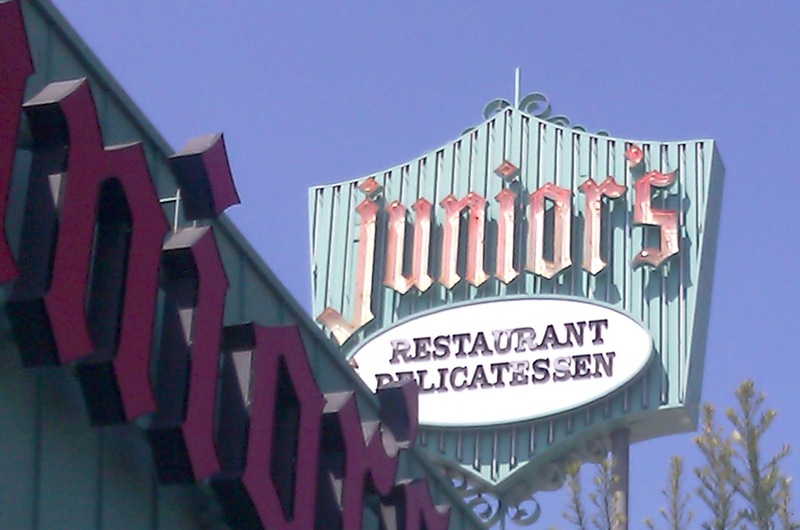 Burger Review : The expansive menu at Junior's Deli seemed to have something for everyone. That is, as long as one was not looking for a burger. Pass.